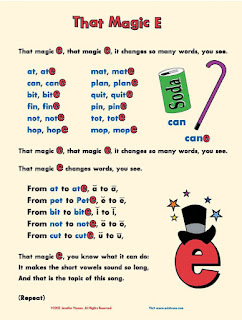 Classroom Freebies Too: Magic E Song by "Miss Jenny and Edutunes"
Magic E Song by "Miss Jenny and Edutunes"
Do you teach your students about the "Magic e?" That's the silent e after words that turns "can" into "cane;" and "fin" into "fine;" and "not" into "note." I've written a FREE song to help your students understand this critical reading concept. You're welcome to download the free printable here, and head to my "Miss Jenny and Edutunes" Teachers Pay Teachers site for the song! ENJOY!